"There's no conflict of interest here. These are complex issues with highly technical minutiae. It's only natural that the experts should lay down the guidelines." NAPD Most Wanted List - Level 1: Each copy of this card costs 1 universal influence, which is separate & in addition to the normal printed influence, and counts against all Identities influence limits, even those in the same faction. 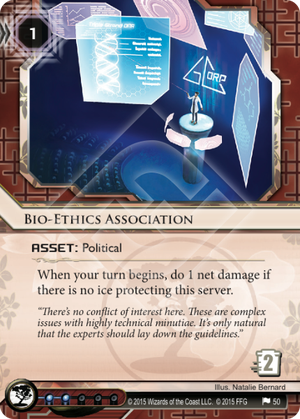 If the only piece of ice protecting Bio-Ethics Association is returned to hand by Blue Sun at the start of the Corp's turn, does the ability of the political asset still trigger? Yes. If the Corp chooses to trigger Blue Sun before triggering the ability on Bio-Ethics Association, then when that ability resolves the "if" clause will be true and allow resolution. MIGHT be useful in Chronos Protocol: Selective Mind-mapping, as a way to get net damage off without the runner having to run or baiting runs for Neural EMP. Though I'm honestly not sure if it will be worth it. Helping flatline decks get that 1 point of extra oomph to go along with their Ronin and Punitive Counterstrike and Neural EMP. It's basically a mini-ronin for that purpose. Not bad. This card will be nuts in Jinteki Biotech: Life Imagineds The Brewery. Having just one of these installed will allow you to do 3 net damage on your turn with only 1 credit. Pair with Snare! and Psychic Field to get the set up. Asset spam Jinteki deck, here I come. I didn't look up spoilers for the new set because I wanted to be surprised. When I cracked the data pack and saw this card I just started screaming and swearing. In aggressive getcha red decks this card is brutal. Jinteki: Replicating Perfection or Industrial Genomics: Growing Solutions will love this as they go wide off Turtlebacks. Chairman Hiro and Ronin kills become more active on the board and less reactive. No reason you shouldn't still run Neural EMP for the option select, though. I think the most generally effective corp card in the set is Commercial Bankers Group for how it helps a lot of different decks, but the affect this card has giving Jinteki archetypes that extra oomph makes it a fun argument over which of the two truly carries more punch.